Pollinators are creatures that are essential for plant reproduction. They assist in the transfer of pollen from the male part of the flower to the female part of a flower. Without pollinators in the environment helping to produce our food crops of fruit, nuts and seeds, we would have a very bland diet. Pollinators come in all shapes and sizes from bees, bugs, butterflies to birds, bats and small animals. Click here for an identification guide to native bees in the southern interior of British Columbia. Gardens, backyard vegetable patch, community gardens, planter boxes, roof top agriculture all provide places for growing plants that are suitable for pollinators. Be the voice in your community to invest in green spaces with provision for lots of unmowed "wild" spaces. Petition your council to plant roadside zones with bee friendly plants such as clover. 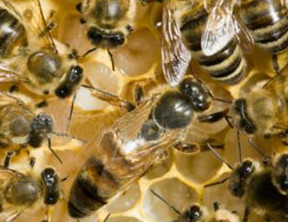 Bees need need pollen and nectar for food. Plant a variety of flowers with different floral shapes to encourage a diversity of pollinators. Seeds of Diversity offers useful information on improving habitat for pollinators. Other insects such as wasps and flies are beneficial for gardeners and should be encouraged too. Predator insects such as parasitoid wasps kill caterpillars and can help reduce the need for chemical intervention. Native Bees: Mason bees and other native bees are great pollinators for your garden. They can be encouraged with nest boxes. Bats: A little brown bat eats hundreds of moths, beetles and other flying insects daily. They are great for pest control and research shows mosquitoes form up to 1% of their diet. Bats are an important part of the urban ecosystem. Build a bat house to encourage these small, insectivorous and very cute little brown bats. All pollinators are sensitive to pesticides. The toxicity effect depends on the type of pesticide, the timing and dosage. If a chemical is necessary, (use only when the need arises) always choose the lowest toxicity, target the one pest and READ the LABEL directions carefully. You can help protect all pollinators by eliminating the use of synthetic chemical pesticides. Simple solutions exist to remove unwanted plants and insects. Vinegar sprayed on weeds will kill without leaving a toxic residue. Detergent can be sprayed on aphids to reduce their numbers. Planting a variety of plants removes the "smorgasborg" effect for insects that prefer one species. Good pairing of plants often provides a repellent effect for some pests (eg marigolds have some repellent affect on nematodes). And there is a lot to be said for removing the pest manually without resorting to toxic chemicals.